Horizons, such as seascapes, make men feel fragmented. The scale of the sea, sky and sun shrinks our own presence on earth to a mere second in time. And so we measure: Time in relation to earth (its rock strata) is “geological time”. A tiny fraction of a split geological nano second ago, we named the present “anthropocene”: the period of time when men began modifying the earth, sea and sky, and anthropogenic residue has come to stratify the world. More precisely: a world which created the horseshoe crab about 400 million years ago. And here we are, right in the middle of Tue Greenfort’s 6th solo exhibition at KÖNIG GALLERY, Greenfort’s first show at the ST AGNES chapel. Under the evocative title 400 Million Years, Greenfort (*1973 in Holbaek, Denmark) presents four new groups of works that evolve around processes of the natural world, discourses of ecology and notions of the environment, while the horseshoe crab figures as a leitmotif to the exhibition’s perspective on human and non-human agency. As it predates life on soil for about 400 million years we call the horseshoe crab a living fossil. On the concrete floor of our gallery, Greenfort’s works seem uncannily petrified and vigorously lively at the same time. Each sculpture of the new series Horseshoe Crabs (concrete, 35x35x15cm, 2017) is rendered in life-size and all of them are hand-cast from concrete, that contains industrial fly ashes; which is a fossil fuel residue of energy plants. Here, the great significance of the term micro comes to the fore:, since it is the ashes’ micro-particles that cause a macro-environmental problem. Nonetheless, Greenfort refrains from clear-cut moralist delineations and puts these pulverised particles to a new and aesthetically stunning use. His critical method prevails, and while taking a look at the creatures spawning in the exhibition, we are also reminded of the endangerment of their biodiverse mating habitat, as shallow waters and coastal zones are continuously modified by men’s maritime industries. Beyond that, the arcane blueblood of the horseshoe crab – its recipe to immortality – is a vital bio-medical commodity, involuntarily donated by thousands of crabs each year. 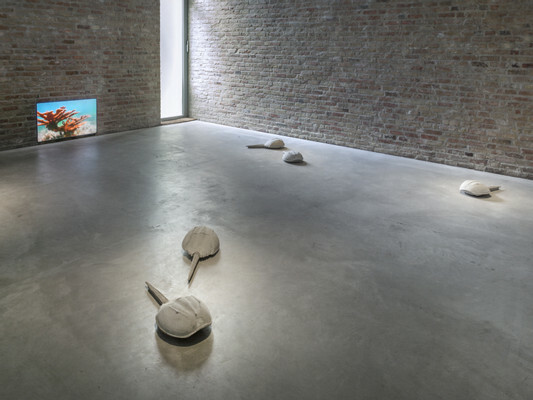 The video work Horseshoe Crabs, Companion Species, YouTube Series I (HD video, 12:24 min, 2013/2017) visualizes such paradoxes on a media-reflective level: Harvested entirely from YouTube, holiday home videos from the beach – in which the alien-like bodies of the crabs are met with exquisite fear and exploratory bravery by pals and pets alike – are interlaced with scientific documentation of the creatures’ bio-chemical features and methods of study. Atmospheric electronical music and a creepy computerized voice-over add to the technological dimension of the bio-political configurations, in this case studies of a “companion species” (Donna Haraway) and an example of “multi-species-intra-action” (Karan Barad). A body politic torn open, simultaneously exterminated and recreated, from egg-state to industrial and scientific afterlife – a fossil life-form haunting our seas and shores. The fish Tilapia (ink on rice paper, 50x69 cm, 2017) is another living fossil. Yet, it is so less in a scientific sense than in its artistic resurrection in print: an actual 1:1 imprint of the fish’s body covered in ink on a paper made of crop, namely rice. While the technique is usually applied for recording a fisherman’s catch, Greenfort had another idea in mind, which was sparked during the artist’s recent research at Lake Victoria in Tanzania. The lake has become infamous as the location and example of Hubert Sauper’s 2004-documentary on the fishing industry, titled Darwin’s Nightmare. Though of relatively young 400.000 years of geological age, lake Nam Lolwe (as it is called in Northern Tanzania’s native language Luo) is ridden with a complexity akin to the aforementioned crab story. It is a delicate kinship: While some species of the Tilapia tribe are endemic to the lake, some others introduced only in the 1950s are invasive and predatory, causing the complete disappearance of the former, and many others – and ultimately of the lake’s entire environmental equilibrium. 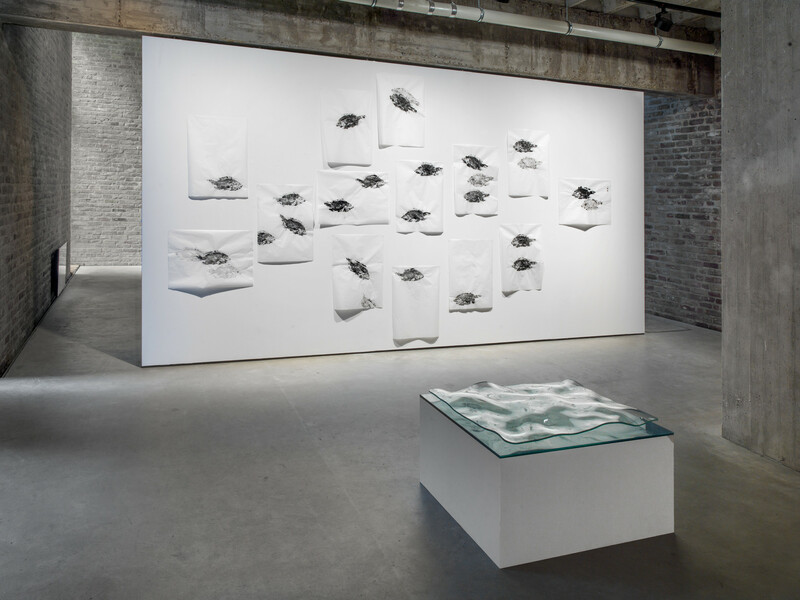 The dramatic dynamics of life and death at stake come to the fore in Greenfort’s black-and-white display of fish on the brink of fossilization. Archival gestures of precarious beings, and not quite unlike forensic fingerprints, those melancholy works of art testify to an experience of the kinship of the beauty and barbarity, colonialism, organic ornamentation, and crime. What lies underneath the surface of symbiosis? What lifts the sum of our parts? What scales the weight of sedimentation? A simple, recognizable, every day form: the seascape, the reflection of light on water, the oscillation of a transfer of energy traveling through space and substance. Seascape (glass, 80 x 90 x 15 cm, 2017) is all that, and so conveys Greenfort’s concerns and creations in a starkly contrasting lyrical way. Metaphors abound, brimming with species, communities, economies; to be experienced, simply – by yourself. Tue Greenfort’s exhibition 400 Million Years is a snapshot of specimen at a point in time. It pursues a sampling sited between faux classification and amateur collecting. It redistributes visibility between the invading and the annihilated. Yet visibility alone does not make art. Imagination sets in. And here we are, in the middle of alliances into uncharted realms. Tue Greenfort’s interdisciplinary practice deals with issues such as the public and private realm, nature and culture. Interweaving these subjects with the language of art he formulates a multi-facetted critique of today's dominant economical and scientiﬁc production. Intrigued by the dynamics in the natural world, Greenfort’s work often evolves around ecology and its history, including the environment, social relations, and human subjectivity. Tue Greenfort (*1973 in Holbaek / Denmark) lives and works in Berlin where he is represented by KÖNIG GALERIE. His work is currently on view in a solo exhibition at DEN FRIE, and at Roskilde Festival, Copenhagen, as well as in a a group show at Arken Museum of Modern Art, Ishøj, at the Aarhus Triennale 2017, Aarhus and at TBA21, Vienna. As a participant of dOCUMENTA(13) in Kassel, Greenfort co-curated an archive on multi-species and co-evolution, named The Worldly House. 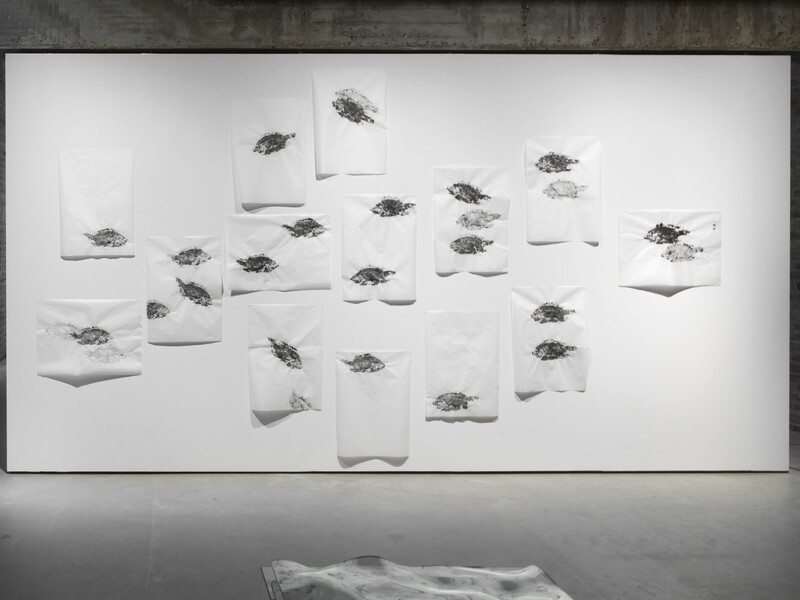 He has had extensive solo presentations at The Museum of Contemporary Art Oslo, Oslo (2016), KÖNIG GALERIE (2014), Sorø Kunstmuseum (2014), SculptureCenter, New York (2013), Berlinische Galerie (2012), South London Gallery (2011), Kunstverein Braunschweig (2008) and Secession, Vienna (2007). He has participated in numerous international exhibitions at renowned institutions including Neues Museum, Nürnberg (2016), ZKM Karlsruhe, Karlsruhe (2015), Kunstmuseum Linz (2014), Gemeentemuseum, Den Haag (2013), Georg-KolbeMuseum, Berlin (2012), Kunstverein Hannover (2011), Royal Academy of Arts, London (2009), Fondazione Morra Greco, Naples (2008), Skulptur Projekte Münster (2007) and Witte de With, Rotterdam (2006). Among his publications the most comprehensive, Linear Deﬂection (2009), was published by Walther König. Wir kennen das Gefühl beim Betrachten des Meereshorizonts, man fühlt sich fragmentiert. Der Makro-Massstab des Meeres schrumpft unsere Anwesenheit auf der Erde zu einer winzigen Sekunde. Also messen wir akribisch: Zeit im Verhältnis zu den Gesteinsschichten der Erde ist “geologische Zeit” und seit einem winzigen Bruchteil, einer geologischen Nano-Sekunde, nennen wir die Gegenwart „Anthropozän”- ein vom Menschen modifizierter Planet. Ein Planet, der vor etwa 400 Millionen Jahren den Pfeilschwanzkrebs hervorbrachte (engl. : Horseshoe Crab). Schon sind wir mitten in Tue Greenforts sechster Einzelausstellung in der KÖNIG GALERIE und seiner ersten Schau in der ST AGNES Chapel. Unter dem Titel 400 Million Years zeigt Greenfort (*1973 in Holbaek, Dänemark) vier neue Werkgruppen, die sich mit den zentralen Themen seiner Arbeit befassen: Prozesse in der Natur, Diskurse der Ökologie, verschiedene Konzepte von Umwelt. Dabei fungiert der Pfeilschwanzkrebs als Leitmotiv, um den Fokus dieser Ausstellung auf die entscheidende Frage nach dem Verhältnis von menschlichem und nicht-menschlichem Handeln, zu lenken. Weil seinem Leben auf festem Boden etwa 400 Millionen Jahre vorausgehen, nennen wir den Pfeilschwanzkrebs ein lebendes Fossil. Auch hier, auf dem Boden der Galerie, erleben wir ihn leblos versteinert und gleichzeitig beseelt. 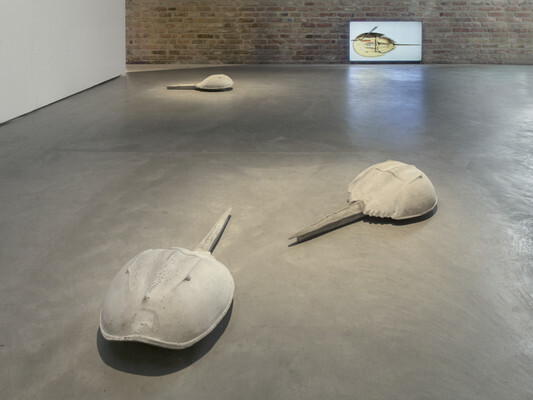 Jede einzelne Skulptur der neuen Serie Horseshoe Crabs (Beton, 35x35x15 cm, 2017) ist lebensgross und handgegossen aus einem Beton, der industrielle Flugasche enthält. Flugasche ist der Abfall, der bei der Verbrennung von fossilen Brennstoffen zur Energiegewinnung entsteht. Hier schon, wird die massgebliche Bedeutung des Mikro deutlich: es sind die Mikropartikel der Flugasche, die die Umwelt im Makrobereich schädigen. Greenforts Zugriff ist jedoch kein klar umrissen moralischer. Stattdessen weist er der Asche einen neuen, durchaus erstaunlichen, ästhetischen Nutzen zu. Greenforts kritische Methode wird deutlich wenn wir die, sich zu vermehren scheinenden Kreaturen, in der Ausstellung, auch als Verweis auf die Bedrohung ihres Paarungsgebietes lesen. Die enorm biodiversen, jedoch von den menschlichen maritimen Industrien modifizierten, Randzonen flacher Gewässer. Das blaue Blut des Pfeilschwanzkrebses findet auch in der Medizin seine Anwendung, wofür tausende von ihnen jedes Jahr ihr Leben lassen müssen. Die Videoarbeit Horseshoe Crabs, Companion Species, YouTube Series I (HD video, 12:24 Min., 2013/2017) verbildlicht diese Widersprüche auf medien-reflexive Weise: Ausschliesslich aus YouTube Clips gewonnen, verweben sich Heimvideos vom Strandurlaub, wo man dem alienhaften Krebskörper mit genussvoller Angst und forschender Neugier begegnet, mit der wissenschaftlichen Dokumentation ihrer biochemischen Eigenschaften und deren Untersuchungsmethoden. Atmosphärische elektronische Musik und eine schauerliche, computerisierte Off-Stimme verstärken die technologische Dimension der bio-politischen Gemengelage dieser reichhaltigen Fallstudie. Zwischen “Companion Spezies” (Donna Haraway) und “Multi-Spezien-Intra-Aktion” (Karan Barad). Eine sezierte Körperschaft, vernichtet und gezüchtet, vom Ei-Stadium bis zum wissenschaftlich-industriellen Gespenst, ist der Pfelischwanzkrebs eine fossile Lebensform die in den Meeren spukt. Ein weiteres lebendes Fossil ist der Fisch Tilapia (Tinte auf Reispapier, 50x69 cm, 2017) – weniger im streng wissenschaftlichen Sinn, als in der Form seiner künstlerischen Belebung. Genauer: als 1:1 Abdruck von in Tinte getauchten Fischkörpern auf einem Papier aus Reis. Während Tue Greenfort sich in seiner Arbeit oft mit Fischen im Allgemeinen befasst, kommt dem Tilapia ein besonderer Platz in seiner künstlerischen Praxis zu. Der Tilapia ist Bewohner eines langfristigen, sozial-skulpturalen Aquaponic Systems, ein mehr oder weniger autonomes Multi-Spezien-Gewächshaus, das Greenfort in einer Weddinger Autowerkstatt eingerichtet hat. Für diese Ausstellung und ihre frischen Fischdrucke, eine ansonsten für die Dokumentation des Fischereiertrags verwendetet Technik, kommt nun eine neue Motivation hinzu. Greenforts Forschungsreise an den Viktoriasee in Tanzania. Spätestens seit Hubert Saupers dramatischer Dokumentation Darwins Alptraum (2004) über die Fischindustrie, hat der See eine zweifelhafte Berühmtheit, im ökologischen Diskurs, erlangt. Trotz seiner geologisch relativ jungen 400.000 Jahre, verfügt der Nam Lolwe See (sein nord-tanzanianischer Name) über eine, der Pfeilschwanzkrebs-Krise verwandten, Komplexität: Während einige Tilapia Arten dem See einheimisch sind, wurden andere in den 19050er Jahren vom Menschen eingeführt. Zuerst zu wissenschaftlichen, dann industriellen Zwecken, niemals jedoch verfügbar für Hungernde. Inzwischen haben die invasiven Raubfische die einheimischen Tilapia gänzlich ausgerottet, sowie fast alle anderen Fische des Sees. Ein katastrophales ökologisches Ungleichgewicht ist enstanden. Diese Dynamiken von Leben und Tod, werden in der schwarz-weiss gehaltenen Präsentation von Greenforts Fischdrucken deutlich. Es sind Erinnerungsdrucke von einem fast fossilisierten Fisch. Archivarische Gesten gefährdeter Geschöpfe. Forensischen Fingerabdrucken ähnlich, bezeugt ihr Schwermut die Verwandtschaft von Schönheit und Barbarei, Kolonialismus und organischer Ornamentierung. Was verbirgt sich unter der Oberfläche von Symbiose? Was bewegt die Summe unserer Teilchen? Was misst das Gewicht von Sedimentation? Eine einfache, wiedererkennbare, alltägliche Form: die Meereslandschaft. Die Reflexion von Licht auf Wasser. Das Oszillieren eines wandernden Energieaustauschs. Seascape (Glas, 80x90x15 cm, 2017) ist all das. Sie übermittelt Greenforts Denken und Schaffen auf kontrastreiche, lyrische Weise. Randvoll mit Metaphern, übersprudelnd vor Spezien, Lebensgemeinschaften, Wirtschaftsformen. Einfach durch den Betrachter selbst zu erfahren. Tue Greenforts Ausstellung 400 Million Years, zeigt einen Bestandsaufnahme von Einzelproben, an einem bestimmten Punkt der Zeit. Sie verfolgt Versuche fingierter Klassifikation und des amateurhaften Sammelns. Die Arbeit verteilt Sichtbarkeiten neu, zwischen Eindringlingen und Ausgemerzten. Doch Sichtbarkeit allein ist keine Kunst. Hier setzte die Vorstelung ein und wir sind mittendrin in den Allianzen sich entwickelnder Wesen, in unerforschten Gefilden. Tue Greenforts interdisziplinäre Arbeitsweise widmet sich Fragen des öffentlichen und des privaten Raums, Natur und Kultur. Greenfort formuliert künstlerisch eine vielschichtige Kritik der heute dominanten Wirtschaft und Wissenschaft. Ausgehend von den Dynamiken der Welt, entwickelt sich sein Werk entlang aktueller Fragen der Ökologie und ihrer Geschichte. Inklusive der Vorstellungen von Umwelt, sozialen Beziehungen sowie menschlicher und nicht-menschlicher Subjektivität. Tue Greenfort (*1973 in Holbaek / Dänemark) lebt und arbeitet in Berlin, wo ihn die KÖNIG GALERIE vertritt. Verschiedene seiner Arbeiten sind derzeit zu sehen in Einzelpräsentationen in DEN FRIE, Kopenhagen sowie dem Musikfestival in Roskilde und in den Gruppenausstellungen im Arken Museum of Modern Art, Ishøj, der Aarhus Triennale 2017, Aarhus und der TBA21, Wien. Als Teilnehmer der dOCUMENTA(13) in Kassel, ko-kuratierte Greenfort ein Archiv zur Multi-Spezien Ko-Evolution, The Worldly House. Vorherige umfassende Einzelausstellungen seiner Werke zeigten The Museum of Contemporary Art Oslo, Oslo (2016), KÖNIG GALERIE (2014), Sorø Kunstmuseum (2014), SculptureCenter, New York (2013), Berlinische Galerie (2012), South London Gallery (2011), Kunstverein Braunschweig (2008) und Secession, Vienna (2007). Greenfort war beteiligt an zahlreichen internationalen Gruppenausstellungen, z.B. Neues Museum, Nürnberg (2016), ZKM Karlsruhe, Karlsruhe (2015), Kunstmuseum Linz (2014), Gemeentemuseum, Den Haag (2013), Georg-Kolbe-Museum, Berlin (2012), Kunstverein Hannover (2011), Royal Academy of Arts, London (2009), Fondazione Morra Greco, Neapel (2008), Skulptur Projekte Münster (2007) und Witte de With, Rotterdam (2006). Von seinen bisherigen Publikationen ist Linear Deflection (2009, Walther König) die umfassendste.